Few neighborhood intersections could be more dangerous to people, or to animals, than where Adams Ave. and Park Blvd meet. So I was surprised to discover a kitty nearby there on Dec. 5, 2017. 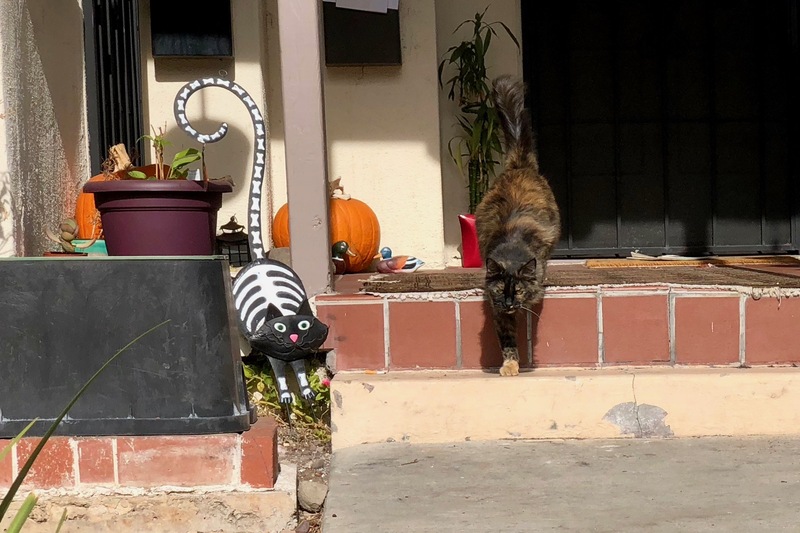 As my wife and I walked by, I heard meowing—then stopped and stepped back to see a long-hair tortoiseshell rustling before a closed door to be let in. I pulled out iPhone X and knelt down to take some quick photos; she scurried to us across the walkway to the sidewalk seeking pats and attention. I nickname the feline Sunshine, for being such a ray of delight; she also reminds me of our Cali. The cat moved around so much, and in contrasting areas of shade and light, that capturing good portraits proved challenging. The Featured Image is a lucky shot, 100-percent cropped 3:2 but otherwise unaltered. I couldn’t have posed the real and fake cats better. Vitals: f/2.4, ISO 16, 1/867 sec, 6mm. The unedited companion capture: f/1.8, ISO 20, 1/883 sec, 4mm. We visited Sunshine for about five minutes, ensuring, after we walked away, that she left the sidewalk and returned to her home property. I hadn’t seen the tortoiseshell there before, and kind of hope that we never meet again. It’s like an atmosphere of impatience hangs over the intersection, perhaps because so many drivers look for parking spaces—and are greedy to get them—along the block where Adams approaches North. No living thing is safe there. 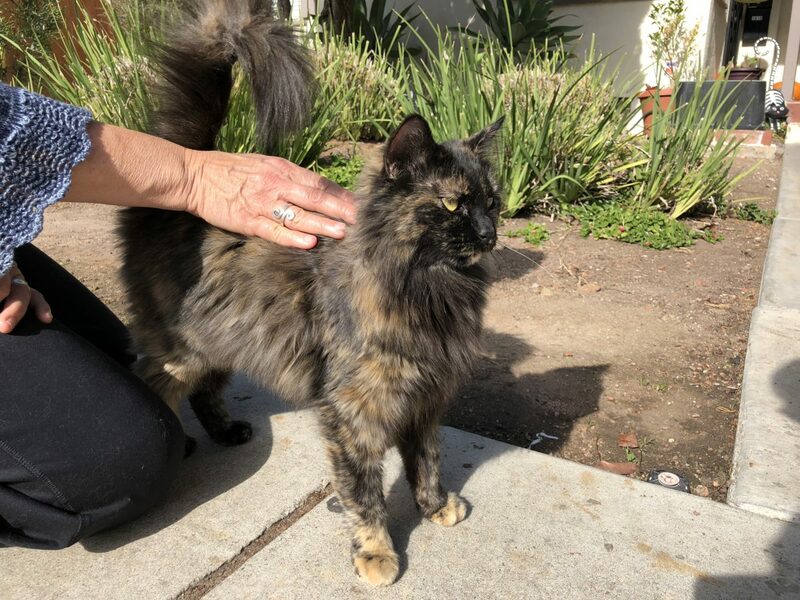 Update June 10, 2018: The owner posted to the NextDoor social network about the tortie being missing. She offered that Sunshine’s real name is Moose. Interestingly, four days earlier someone else private messaged asking if I knew who the owner might be; he was concerned about the animal. I discouraged any interference, emphasizing the cat likely has an owner but roams (like the beasties often do). Update June 20, 2018: A nasty neighbor abducted and later surrendered Moose, following an intervention that included San Diego police officers. Please read my overly-long recollection. I participated in the saga. Previously featured felines: Scruffy, Roly Poly, Woo, Skull, Biscuit, The Colonel, White, Chipper, Frisky, Stretch, Needy, Farfisa, Mates, Hunter, Pee-Pee, Blue, Blue Too, Bonded Pair, Patience, Fess, Jumper, Frenemy, Looker, Cozy, Scout, Lurks, Skit, Mini, Betty, Black and White, Stalker, Bell, Chill, Sammy, Scratch, Poser, Star, Grey and White, Watcher, Herman, Comet, Roman, Willow, Chub, Nimbus, Watson, Lilo, Kit, Pepe, Twilight, Sebastian, Spot, Booger, Ash, Veruca, Riley, Mellow, Bonde, Flower, Glass, Black, BeBe, Fang, Bruce, Siamese, Pounce, Tortie, Haiku, Fraidy, Peso, Daniel Tiger, Dusk, Stride, Dainty, Spry, Tabby, Betty Too, Still, Levi, Shadow, Sophie, Wink, Ferals, Momma, Charlie, Tux, Cool, Benny, Jellicle, Itchy Valentino, Goldie, Nine, Amanda, Siesta, ChaCho, Charlie, Too, Mika, Crystal, Seeker, Mittens, Dancer, Smokey, Monkey, Captain Blackbeard, Season, Maven, Tink, Chunk, Curious, Hanoi, Bella, Tarry, Guido, Maxine, Mr. Kitty, Peohe, Panda, and Frankie.